Presenting the world premiere official release of Trevor Jones’ (EXCALIBUR, THE DARK CRYSTAL, CLIFFHANGER, NATE & HAYES) riveting original score to the 1982 Paramount Pictures cult chiller THE SENDER, starring Kathryn Harrold, Zeljko Ivanek, Shirley Knight and Paul Freeman and directed by Roger Christian. Jones’ lush, complex orchestral score is as breathtakingly beautiful as it is haunting and terrifying – an early, but notable work in the acclaimed composer’s cannon. Produced by Dan Goldwasser and mastered by Mike Matessino, this special release features in-depth liner notes by film music writer John Takis. This is a limited edition of 1500 units. 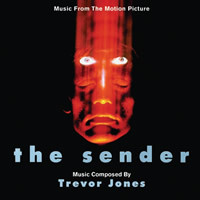 This presentation of Trevor Jones' score to THE SENDER came from a 1/4 " mono source found in the Paramount vault. As it was not the complete score, it could be surmised that this source was intended to be used for an LP release at the time of the film's release - but it is not certain that is the case. The material was transferred by Johnny "Dee" Davis at Precision AudioSonics, and once an assembly was compiled, digital mastering was handled by Mike Matessino. THE SENDER is a moody and affecting score, and we hope that you enjoy this early work by Trevor Jones.